Dr. Greene specializes in Northwest Semitics (philology, epigraphy, palaeography) and the compositional history of the Hebrew Bible (esp. in 1 Samuel). 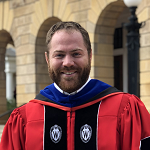 In 2012, he brought Reflectance Transformation Imaging (RTI) to the CANES department and has been one of the lead developers of the Wisconsin Palmyrene Aramaic Inscription Project (WPAIP). Additionally, he has been one of the photographers for the Hesi Regional Project and archaeological work at Khirbet Summeily. He is active in both the SBL and ASOR and serves as an executive board member of the Colloquium for Biblical and Near Eastern Studies.